Createspace Independent Publishing Platform, 9781456308612, 280pp. A true story about a man's search for family and the resultant joy and exhilaration of discovering himself and his place in the world. 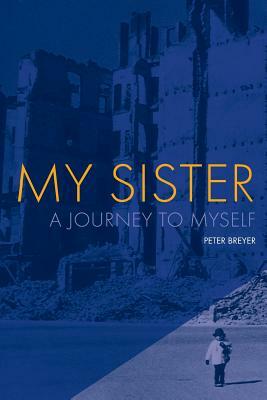 Biography of Peter Breyer Late in life Peter Breyer learned that he had a half sister from his father's previous marriage in Germany during the Weimar years of the 1920's. The revelation was life-altering and resulted in his first book titled "My Sister: A Journey to Myself" published in 2010. The experience inspired him to continue writing. His second book, "The Mountain of Hope" will be released shortly and he is at work on a third book, "Indian Joe's Treasure." The themes of interest to Peter Breyer concern the ultimate goodness of man and the power of belief and redemption to make our lives more meaningful and rewarding. Peter Breyer was born in New York City to immigrant parents who fled war torn Europe in 1941. He attended City College of New York and completed a 1965-1967 tour in the Peace Corps in the South of India. He received his Ph.D. in City and Regional Planning from Rutgers University and has worked as a strategic health planning consultant for the Urban Health Institute which he helped found in 1973. He is married for over 40 years to Mildred Harper, whom he met in the Peace Corps. Their son Darrell and daughter-in-law Senait live in New York City with their daughter Miah who was born in 2008. Peter Breyer divides his time between suburban Somerset New Jersey and the pastoral country setting of Hillsdale New York, where he indulges his passion for working his 60 acres of forested mountain lands. It is those mountains and those Indian and immigrant farmers of the past who inhabited his two new books. He believes that the land has a story to tell and once told it reveals as much about our lives today as about those who lived in the past.